Darlyne used to tell stories about when John was a baby. She said he’d crawl to the nearest electrical outlet and want to stick his finger in it. She’d tell him no, gently slap his hand, pull him away, and yet he’d return. She’d do that over and over, trying to hinder him. She’d turn his attention to something else, trying to distract him. Finally, she’d give up, and she’d have to cover the outlet. I narrowed my daughter’s choices. Instead of offering a blue cup and her demanding a green one, I’d offer both colors and let her pick from those two. Of course she’d then want the red cup, but I didn’t give in. She had to pick between the two. This worked for clothes, snacks, and other things. I’d still give my daughter a choice, but I’d limit those choices. After a while, the battles stopped. She soon understood that I wouldn’t give in to her whines. I prepared her for interaction. If we were going to church, I’d explain possible things that could happen, such as people introducing themselves or commenting on her pretty dress. I’d role-play the correct response with her. And then I’d reward her when she responded correctly. I soon discovered that with some instruction, my daughter not only responded correctly, but she soon came out of her shell and became a chatterbox. I stood by my word. Even if my daughter disagreed or challenged me, I didn’t give in. I learned that giving in was showing her that a bad attitude would get her what she wanted—and that’s not what I wanted to reward. Once that no longer worked, she discovered that behaving well got her the best results. I focused her strong will on positive things. Academics, piano, and friendships – I gave her the tools to excel in things she was good at, using her will as a benefit. And when the going got tough, she dug in. I focused on filling her love tank. My daughter is a quality time and gifts person. She gets excited when I bring her a pack of gum or her favorite lip gloss from the store. She loves when I take her to coffee or when we go to lunch. As we spent time face-to-face, my daughter opened up about everything she was dealing with. She even confessed to some areas that she struggled with. I discovered that she wasn’t as strong as she liked everyone to believe. When I filled her love tank, her will weakened, and we built a bond that has remained for years. As the months passed, my daughter’s attitude changed and I enjoyed her more and more. I also discovered her strong will did help her excel. At 22, she lives with two roommates in the Czech Republic, and she shares her faith with teens in a place where 90% of people are unchurched. When her peers are still in college, she already has her degree and moved on to mission work. Her will pushed her through four years of college by the time before she was twenty-one. Her will has helped her adjust to a new country and find ways to push through spiritual barriers in this former Communist land. Looking back, I’m appreciative that God made her who she is for a reason. With a will like that, she’ll be able to do many things for God’s glory! I can’t wait to see what else God has in store! God, THANK YOU for my strong-willed child! They have a valiant sense of strength. I’m honored to have the opportunity to instill valuable character traits in them. Guide my patience, my parenting tools, and my own sense of strength. Thank you!! This was very much needed today. You’re VERY welcome. God is good! My daughter is four, with an invincible will. My parents raised three strong-willed daughters, and I’m frequently calling my mom for consolation. I keep reminding myself that her strong will and analytical mind will be a benefit to her some day, though they make the early years such a challenge. Your example brought tears to my eyes as your 22-year-old daughter is an example of this point, and I am starting to discover ways to connect with my own daughter. Filling her love tank is so hugely significant around here. She’ll go weeks without a nap despite her tiredness, until I discovered I have to lay down with her at nap time until she falls asleep. I’m hoping this doesn’t last forever, though I cherish the bond. It’s obviously something she needs right now. Corey, the seasons go so fast. I love the bonding time that you’re establishing! Thank you! This was just what I needed to hear right now! I believe I have 3 currently on my hands and one more on the way that I do not expect to be any different. This is a great reminder of what we need to be doing as parents to love our children well and let them be who they are without letting it get out of control. Thanks for this! Excellent post – one I can related to. The more I stick to my word, the more my child trusts me. I really appreciated this, Tricia. Thank you! Thank you for this..I sit here typing with tears streaming down my face..my son is so challenging..and I feel every ounce of his upset. But again, you have encouraged me. I can’t thank you enough. Kerry, God has a special plan for your boy!! Trust that! Remember that strong will will get him far! I am just realizing lately that my middle daughter who is 7 is quite strong willed. I’m a pretty relaxed parent that while they were growing up and even now I give them lots of choices. They’ve always been able to pick out their clothes no matter how mismatched, which helps when we do have a special occasion where I care more, like Christmas or family photos and I can say, you always pick, today I get to pick. Anyway, I have been having problems with her not being willing to do a task such a piano practice or homework. She simply says No. I can have a her in time out, for 7 minutes and she comes back with No still. I’m not sure what I can do to change her bad attitude about the stuff that needs to get done. Reward her for finishing tasks! Even small rewards are very motivating! My son is very strong willed, some call it oppositional defiant disorder. It has been rough to say the least. He is now 17. When my son was younger someone suggested we use a “yes/no” jar. Each time we asked him to do something and he did it a yes would be put in a jar on a piece of paper, if he refused or did not get it done then a no would be put into the jar. Then when it came to the times when he wanted something, like to go to a friends house ,watch tv or a movie, be taken to the store, have a cookie etc… We would draw out of his yes/no jar for the answer. This helped to teach him that he is accountable for his actions and the way he handles things in the here and now can affect him in the future. That is a really good idea and something I am going to implement! My strong willed son is 12 now and, some days, as argumentative as ever. I think a yes/no jar would really help him see his own behavior in a new light. Thank you so much I n ended this to boost up my mood. I’ve been having a hard time with both my girls!!! You’re welcome! God can use it for good! Thank you! This was so encouraging for me to hear. My husband and I have two young, beautiful, smart, and strong willed children that challenge us on a daily basis to prove we are the parents God has created us to be. On the rough days, I wonder if any of us will even survive, let alone get it right. You will survive and some day you’ll see how it all worked for their good! Thank you so much for sharing this. I have been thinking a lot about Godly parenting and believe you have been part of my answer. Did you take that parenting class at your church or was it through another organization? If through a different organization is it still offered (I realize that it was many years ago so if you have no idea I understand)? Again,thanks for sharing. My favorite parenting books: Sacred Parenting & Love and Logic. We also did Growing Kids God’s Way at our church, and we pulled a lot of good stuff from that! Thanks for the post. I am almost 4 years into this with a beautiful and amazing little lady. I don’t give in. Battles continue. I am glad your techniques worked for you. My little one is iron. Someday, I pray, polished iron. I am exhausted but oh well. She has an iron will but I have iron love. I love your words, Tracy! I hear three is much worse..ugh. Ok, this was an awesome comment, I also have a “terrific two” who did not become terrific at two..LITERALLY the day she was born she was “H’angry”…ie hungry & angry about it simultaneously & has never stopped. She would throw down for food any day of the week & at least 6 times each day of the week. She turned two in Sept of 2014 & this being Dec. 17, 2014 can I just say nothing has really changed. All the advice for strong willed kids I generally laugh at b/c most of it is NOT APPLICABLE to my particular “blessing” I have found small choices are helpful & spending time doing fun things helps when the battles come, we both have loving positive experiences to pull from in the midst of her “moments” (that feel like eternity). Don’t assume 3 is worse, I have 2 strong willed girls the oldest is 6 & 1/2 & she is not nearly the terrorist my youngest is lol, but 3 wasn’t bad for her at all. You never know what you will get but God’s grace is sufficient even when I find myself flooded w/ tears b/c I feel insufficient as a mother of such a STRONG IRON WILLED child…I know He is even when I am not. Thanks for your story again, it definitely sounds EXACTLY like my 2 yr old. Blessings & Merry Christmas! Oh my! These kids are going to be great leaders some day! Are you sure not talking about my grandson ? I dread going to the store with him because I’m not sure what is about to happen. He will run off and then throw a fit if I put him in the cart or in a stroller. He says I am a big boy. I put him in time out, everything I can think of and he wears me down. Brittney, spend 5 – 10 minutes a day playing something she wants. Let her take the lead. Praise her, comments on her good ideas, and repeat what she’s doing. “You are playing with your doll,” etc. I think this will really help. When she gets her turn sometimes maybe she’ll let you have a turn, too! wow! So nice to hear that I don’t think I’m the only one going crazy with this beautiful “phase” our little babes go through!! I was/am a strong willed girl/woman myself and remember clearly my mother joking with me before I had children by saying, “you just wait. Your daughters (cause of course she knew I would have 2!) will be just like you”. Ahhhhh! She was right!! My 2 1/2 year old is a tornado! Anything doesn’t go her way it’s the end of the world even if I just by habit simply turn on/off a light switch. “No mommy! I do it! !” I’m very blessed she is strong willed and independent like me but wow this age is a challenge for me for sure! Very uplifting post and other comments!! Thank you! I’m so glad that you were encouraged! Stay strong and keep loving those girls! Thank you so much for the insight about strong willed children. I wish that I had this information when my son was growing up. He is 23 and still strong willed. He has two beautiful boys and one is very strong willed. I understand know that he just wants to be respected and appreciated. He wants to be listened to. Narrowing his choices will help with the struggle over breakfast and what to wear. I want them to grow up and use that determination to please God and be willing to step out on their faith. Constance, yes … once they get pointed in the wrong direction, watch out! I am so glad I came acrossed this post! I have a very strong -willed, 8 year old girl. Your post gives me hope. God Bless you! we have two strong willed…..a five and two year old. The five year old throws tantrums and whines when she doesn’t get her way, despite the fact we’ve never given in. We remind her that this has never worked, but can’t seem to end the tantrums..she also has a flair for the dramatic. Little sister is following in her footsteps. What do you recommend? Also, I assume for the “filling the love tank” you are referring to the love languages…where can I find this info? The thing that works great is to praise every little thing they do right. The more you do this the more they’ll want to do good things. Right now she (they) get a lot of attention from the drama. Encourage positive behaviors instead through praise! 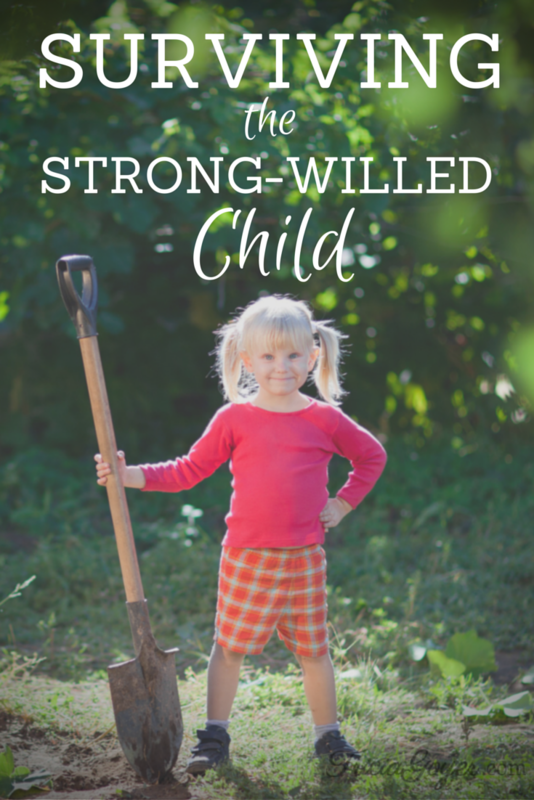 As the mom to a strong willed child, I appreciate this post. I love how you mentioned that a strong will is helpful as an adult. So true! I was a strong-willed child and did my best to drive my parents insane. I laughed when I read this, though, because, like your daughter, I graduated University with honors at 20 years old and am living in the mission field, and have been, now, for almost 2 years. I love doing the impossible and things people say can’t be done. I love conquering things. What scares me though, ha ha, is that my husband is also strong-willed and also did things everybody said was impossible. So our chances of having a strong-willed child of our own are high. So I’ll get payback for the times I made my mom cry. But I totally agree with the advice on this blog! When you get close to your strong-willed child, you get “on their side,” and it gets harder for us to fight. My parents didn’t discover this until too late, and my dad, especially, always had a fight on his hands if I didn’t want to do something or I wanted something that he didn’t want me to have. Thanks for the post! Congratulations on the strong-willed child! Here’s to hoping she always has a good fight to fight! I saw this article on Pinterest & decided it would be a good read. I’m so glad I read it! Thank you so much for posting this! A lot of the comments you made about your daughter and the relationship you had with her when she was young mirror what I am dealing with now with my daughter. I’m definitely going to try the techniques you used! THANK YOU! I needed to hear this! My 5yo is EXACTLY this. I used to try to break her strong will. That worked against all of us. We are working “together” a lot better since I stopped trying that. This article brought me to tears. God has blessed us. God is good all the time. This comes at a perfect time. I have two strongwilled daughters, four and six. Our six year old, M, is generally willing to listen, and follow instructions, and has done very well in school despite her leader tendencies being labeled as “bossiness” by her teacher. Our four year old, A, is going to be the end of me one of these days. She has so much energy, and knows exactly what she wants and when she wants it, and if things don’t go acording to her plan and routine, she acts out in every way possible. My husband and I have actually considered having her evaluated because of late her behavior has been more than I can handle some days-he is disabled, and I am typically working or volunteering every day of the week while she is at daycare. I was pretty strong willed as a child, but in a different way than our four year old (though my dad still laughs about karma)-my mom, when I describe any of A’s wild antics of the week, will laugh, or offer commiseration, but since the child is different hasn’t been able to offer more than an observation that most of her stunts seem to come down to power struggles-she wants all the power to do as she wants of course, and we won’t let her. It is nice to read, even a year after the post, about someone else’s experiences with a strong willed child, and the successes. I know they are both going to face a lot as they grow up, and that their strength will be a blessing to them as mine has been to me. I just have to keep reminding myself of that. I know you wrote this a while back but I am just reading it. This is something I’ve been realizing and praying about my 22 mo old daughter is SO strong willed. The tantrums and doing the opposite of everything I say is almost a daily routine for us. Even with all that though I still see how good and smart of a girl she is. She amazes me. I have recently started praying that God would show my husband and I how to parent the way she needs it and I am praying her strong will will be used for His glory! I constantly am praising her for her good choices (hugs,high fives,etc) saying that makes God and mommy and daddy so proud!! It’s so encouraging to here the story of your daughter. God and you are surely proud! Thank you for this. I have 2 children. My son (14) was and still is so easy. He goes with the flow. My DD (5) however, is VERY strong willed! Even though at times I struggle with it, I know that she will not be a push over type of child! She will stand up for herself and is determined to be self sufficient! Thank you for the ideas on how to handle certain situations! thank you, thank you, thank you for this article! My 2 year old daughter is strong willed and as exhausting as it can be, she will do amazing things one day! I constantly work with her and as tiring as it can be sometimes, it is so rewarding being able to see such determination in her. Such great advice. Thank you! Really needs to hear this today as my two year old boy is bulldozing our home! Thank you. I always have in the back of my mind that his strong-will would be one day channeled for his benefit, but it’s hard to remember on days like these. Again thank you for sharing! This is my child! (sometimes I wonder what I have done to deserve this?!? lol) But that strong will is what keeps her going with Cystic Fibrosis. She weaned herself off the ventilator WAY, WAY, before she was suppose to be off. She then came home from the hospital weeks before they said she would. She has managed to always do everything the doctors said she couldn’t do, This is a helpful article, I learned some of these tricks before I read it bc I would rather manipulate the situation than fight. However, I laughed out loud over the colored cups! This very thing happened to my husband yesterday. I must say that I just love where your little girl ended up, very inspiring and thank you for the prayer. THANK YOU for your encouraging words!!! My son (5) has a strong will. And – I´M FROM CZECH REPUBLIC :-)!!! Just because someone doesn’t believe what you believe doesn’t mean they are “unchurched”. Yours is not the only religion or believe system so try to be a little more tolerant. Have a nice day. thank you for sharing! I have a strong willed 4y/o who would drive me to the limits of my sanity!!! Slowly I am learning, with God’s help, to deal with him and to correct and redirect him with love and not anger. When he hears there are some people who do not know God or who do not believe in God, he will say “I will go and tell those people God exists and He is alive!”. Reading what you shared made me realize that his strong will will carry him to fulfill that same mission! Yes, it can! Set that strong will in the right direction and you’ll be amazed what God does! Thank you so much for these tips! My 11-month-old daughter is very strong-willed (more than a little like her mom! ), and I know from my own experiences that those qualities will serve her well when she’s older. But right now, raising her and teaching her is hard! thank you! this is so very encouraging. I was a very strong-willed child growing up. and even though I KNOW that having a strong will turns into a blessing if guided, it still can seem daunting and weary-worn and tattered. Because the Lord gifted me with two strong willed blessing girls. the variety God can create with strong will is a testament to his love of uniqueness. I am strong will too. The behaviours your daughter exhibited in her early life was similar to mine but no one understood me. 1. I have been able to live with one man (my husband) for over 22 years despite serious threat of divorce from peers, friends and outright rejection by family even though the time we started this relationship, we were not christians. 3. I am excelling in my christian raise because my focus is on Jesus and never on the leader or the ministry and I resfused to be distracted by the ‘bad guy’ attitude. Thank you for a wonderful story, inspires me to have patience and believe in my kids. They are 3 now twins, very strong-will also. I pray that God will guide us in his path. Is such a great feeling to read when people talk about God and their faith. God bless you.